Changing Lives with the Healing Power of Horses. Alatheia is the New Testament greek word for “disclosed truth”. In Ephesians 4:15 the apostle Paul calls us to speak the truth (alētheuō) in love to one another. For the Alatheia community, it is a way of living, and the riding center is how we choose to speak truth. History Alatheia Therapeutic Riding Center was founded in 2011 by Glenn and Nancy Grette. 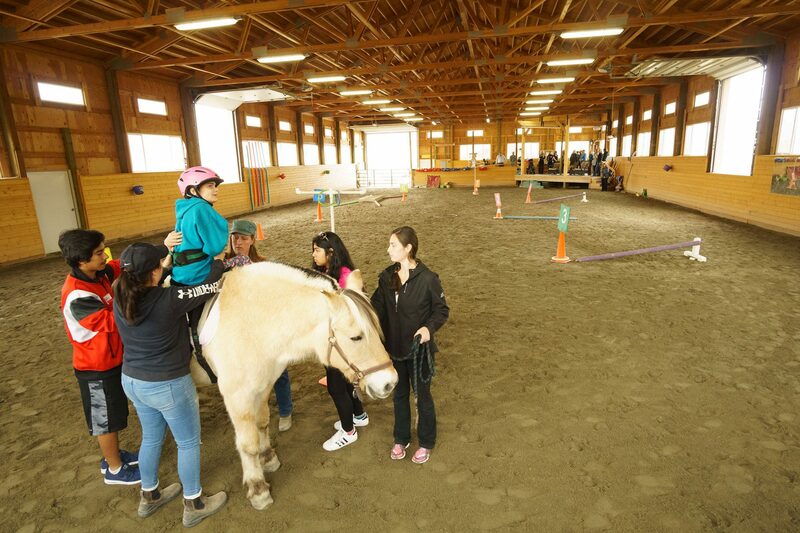 In June of that year the center opened its doors to 12 riders with special needs using three amazing fjord horses and about 25 enthusiastic volunteers. Many of those original participants still ride and volunteer at Alatheia today! 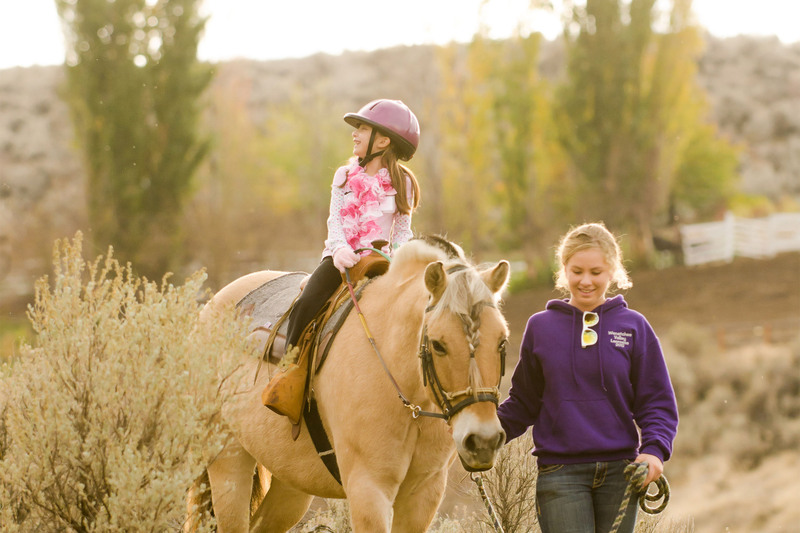 Between the therapeutic and adaptive riding programs, Alatheia serves a wide variety of special needs. Ranging in age from 2 ½ to 86 our riders may have a learning disability, genetic disorder, traumatic brain injury, cerebral palsy, stroke, autism, or epilepsy. The demand for alternative therapies for people with special needs in North Central Washington is high and largely unmet. As a result, we have experienced steady growth in Alatheia’s programs over the years and now serve 85 riders each week and now have 8 Norwegian Fjord Horses, five part time instructors and nearly 100 volunteers. At this size Alatheia is at capacity for our current location on the Grette’s personal property. With an expectation of growth to nearly 150 riders per week there are limitations due to acreage, parking availability, and arena and barn expansion. Alatheia’s ten year strategic plan calls for a move to a larger facility by 2020 and we are well on our way to realizing that goal. 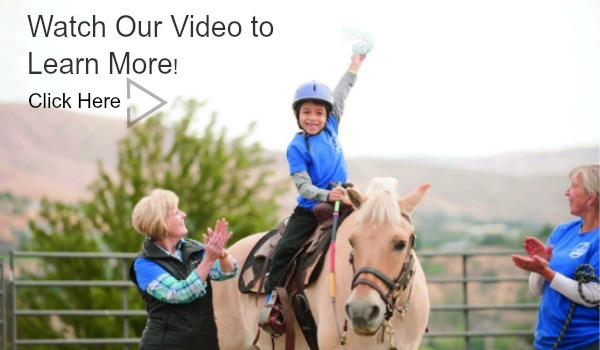 The Healing Power of Horses Born from the combined love of horses and children, Alatheia Therapeutic Riding Center demonstrates the power of equine-based therapy. It is a non-profit therapeutic riding center, affiliated with PATH (Professional Association of Therapeutic Horsemanship), formerly NARHA (North American Riding for the Handicapped Association), and NFHR (The Norwegian Fjord Horse Registry). Non Profit Alatheia Therapeutic Riding Center is a 501(c)3 corporation and is publicly supported through tax-deductible donations. Your support helps to provide facility enhancements, equine care, and reduced cost lessons to these unique children and adults. Physically Strengthens the body in a way that can actually help riders learn how to walk. The participant’s need to balance and stabilize while in the saddle improves core strength. Riding also increases coordination and depth perception. Emotionally Encourages participants to form closer bonds with those around them by learning how to bond with the horse, giving the rider a new found joy. Schedule We offer lessons all week long and a longer riding season than ever before. Riders sign up for sessions that consist of weekly lessons over the season, from early Spring to late Fall. Neither wind, rain, snow, nor heat will disrupt lesson schedules. 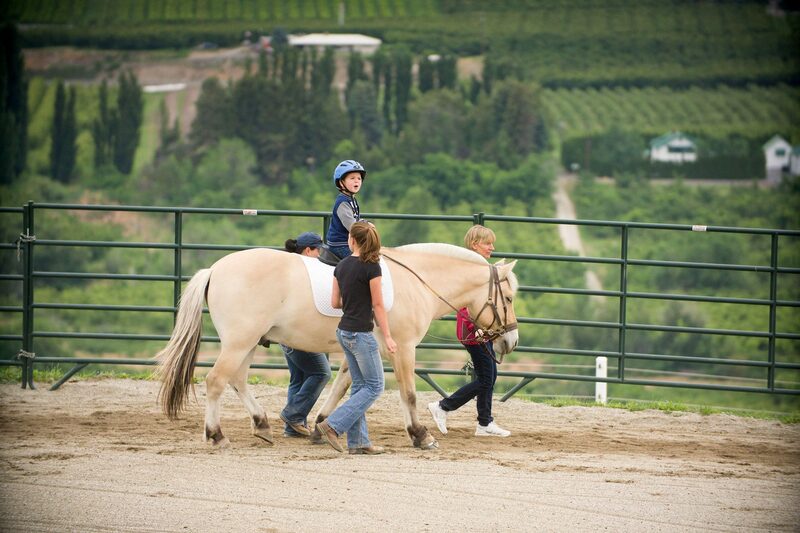 Location Alatheia Therapeutic Riding Center is located on a picturesque hillside above the lower Sunnyslope area in Wenatchee, Washington. Situated on 4 acres there is an open air barn, tack room, 66’X132′ outdoor arena with ADA mounting ramp and platform, a 60’x120′ indoor arena with ADA mounting ramp and viewing platform, and a ¼ mile hillside trail. The view is beautiful and provides a wonderful opportunity for respite to the parents and caregivers of our riders. 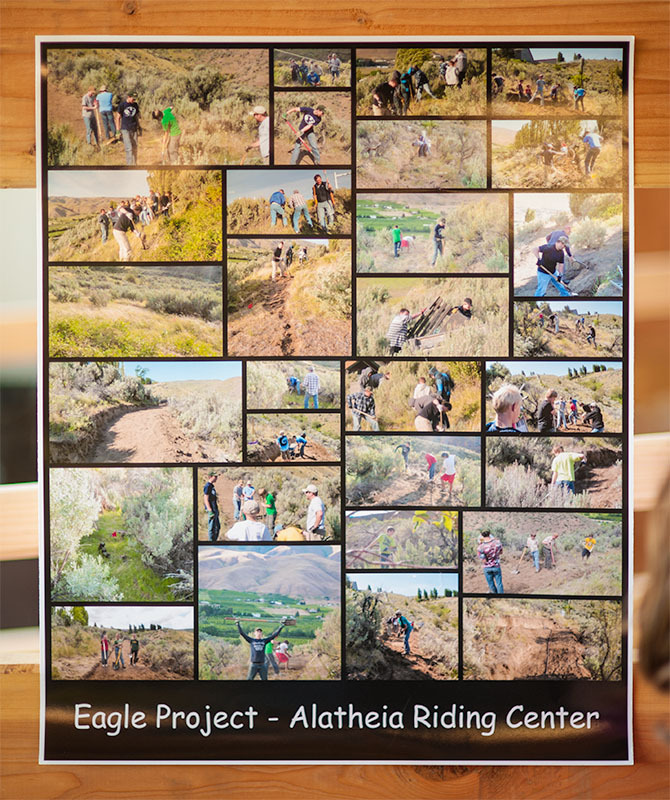 As Alatheia Riding Center developed and grew, it became our desire in the spring of 2012 to provide our riders with a “real” trail experience that would expand on the sensory and movement benefits received in the arena. We had an acre of rough, sagebrush land on a sloping hillside immediately adjacent to our property that would be a perfect place to do this, but no idea on how to make it happen. Within 6 weeks Brian had completed a 1/4 mile trail, 5 feet wide (enough to accommodate horses and side-walkers) winding through the hillside. All it took was one offhand comment to a volunteer wondering if there was a Boy Scout troop out there that might be interested in a project. Almost immediately we were contacted by Brian Merrill of East Wenatchee who was looking for an Eagle Scout project. Within 6 weeks Brian had completed a 1/4 mile trail, 5 feet wide (enough to accommodate horses and side-walkers) winding through the hillside. Brian managed a team of about 18 hardworking scouts and adults who came weekly and carved that trail out of the dry, hardened slope with hand tools and wheelbarrows! The trail is a delight to our riders and often a highlight of their time at Alatheia.